It was an emotional night for the Pittsburgh Penguins and their beloved former goaltender, Marc-Andre Fleury. PITTSBURGH — It was an emotional night for the Pittsburgh Penguins and their beloved former goaltender, Marc-Andre Fleury. Fleury was back in the city where he started his NHL career and spent more than a decade, helping to backstop the Penguins to multiple championships. The Penguins wanted to honour their old friend — and they did — but they also wanted to win. Third-period goals by Evgeni Malkin and Phil Kessel ruined Fleury's homecoming as the Penguins defeated the Vegas Golden Knights 5-4 on Tuesday. "I think it was an important game, and obviously with (Fleury) coming in it added a lot of emotion," Penguins captain Sidney Crosby said. "Once you get out there, you're trying to win a game and he's trying to do the same thing." Fleury, who won three Stanley Cups with the Penguins — including the last two seasons — returned to Pittsburgh for the first time since Vegas selected him in the expansion draft last summer. Fleury, who stopped 33 shots, beat his former teammates in December in Las Vegas. "The game was (in Pittsburgh), so it was different," Fleury said. "It was very weird, but it was a game I'll remember forever." In the first meeting between the teams in Pittsburgh, Malkin gave the Penguins a 4-2 lead with his 30th of the season at 3:09 of the third period. Malkin, who scored in his fifth straight game, became the fifth player in team history to score 30 goals six times. Jake Guentzel, Ryan Reaves and Ian Cole also scored for Pittsburgh, which won for the fifth time in six games. Matt Murray, Fleury's former understudy in Pittsburgh, made 21 saves to top his mentor. William Karlsson scored his 28th of the season on a power play for the Golden Knights. James Neal, who spent four seasons in Pittsburgh, got his 23rd. Ryan Carpenter and Jonathan Marchessault scored in the third period for Vegas, which nearly rallied from a three-goal deficit. The Western Conference leaders have 20 wins in their last 28 games. Fleury, the No. 1 pick in the 2003 NHL draft, spent 13 seasons in Pittsburgh and set team records for games and minutes played, wins and shutouts. Murray stepped in when Fleury went down on the eve of the 2016 playoffs. He helped the Penguins to the franchise's fourth Stanley Cup and eventually grabbed the No. 1 job. Fleury waived his no-movement clause before the trade deadline last spring so the Penguins could protect Murray in the expansion draft. Fleury briefly regained the starting job before leaving Pittsburgh when Murray aggravated an injury during warmups prior to the first game of the playoffs. He won nine games and helped eliminate Columbus and Washington before Murray returned in the third round of the playoffs against Ottawa. The organization put together a tribute video for Fleury that was shown during a first-period stoppage in play. Fleury stood stoically behind his net and rested his glove on his stick as he took in the highlights. The crowd roared in appreciation and gave a long standing ovation to Fleury, who raised his stick in the air and waved to the fans. Murray took it all in from the other end. 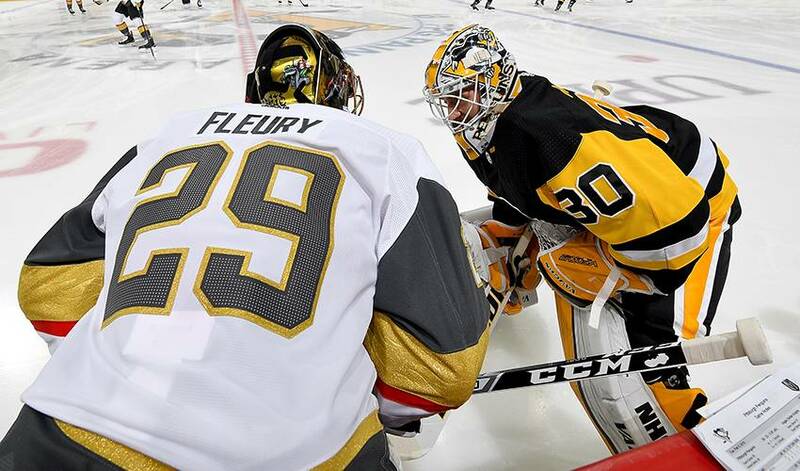 "Those are always fun to watch and they bring back good memories of the last two years, especially a guy like (Fleury), who was a big part of my development," Murray said. "He was a really good friend and mentor." The crowd gave Fleury his first standing ovation of the night as soon as he hit the ice for pregame warmups. A larger-than-normal crowd of supporters gathered behind the visitors' goal, many holding handmade signs and cheering each time he took the net. "We knew it was going to happen," Murray said. "He's well-liked and everybody loves (Fleury) for good reason. He deserves every bit of appreciation he gets." Fleury tapped Murray on the pads during warmups and the two had a short chat while stretching. At the end of warmups, Fleury skated to the red line and took a shot off the pads from Penguins defenceman Kris Letang to the delight of the crowd. "I didn't know what to expect," Fleury said. "In the warmup, I had goosebumps. It's a night I won't forget." NOTES: Pittsburgh won its season-high eighth straight home game. ... Penguins forward Patric Hornqvist is week to week with a lower-body injury. Pittsburgh also scratched defencemen Matt Hunwick and Chad Ruhwedel. ... Golden Knights forward Williams Carrier returned to Las Vegas to be evaluated by team doctors. The team also scratched defenceman Jason Garrison. Golden Knights: Complete a three-game road trip Thursday at San Jose. Penguins: At the Dallas Stars on Friday.